A short Tip for those of you who want to translate the Tags of the Finder (f.e. made by Hazel https://www.noodlesoft.com/forums/viewtopic.php?f=3&t=10822) to the Calibre library. What it does: it tells Hazel to process all folders which have a certain "Full Name" (because we want to include the folders with a "." in the name) that contain a file that has the tag "Hegel". So to the metadata.opf we want to add the tag "Hegel" to those files with the tag "Hegel" so that calibre recognizes those tags. eval calibredb set_metadata "$a" "$i"
Make sure that Calibre is closed otherwise the script will deliver an error. Now: wherever I wrote "Hegel" you can add every tag you want (or multiple) to insert into calibre. 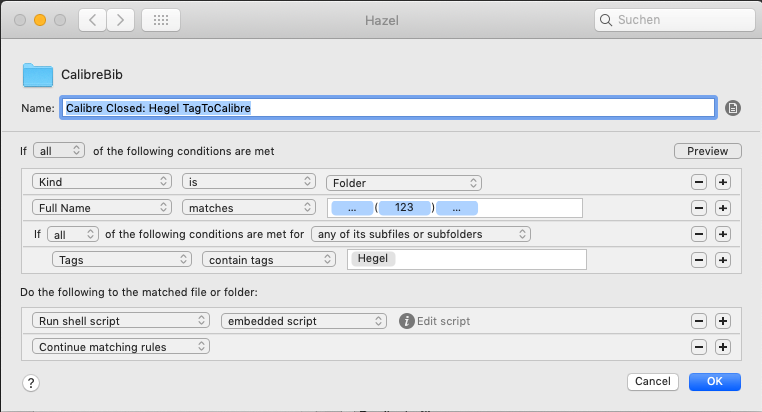 You will need a rule in Hazel for every Tag you want to add – so simply copy your Hazel rule and change the Tags. If you know of a better way or see any flaws or possible improvements of that Hazel rule, please write me!